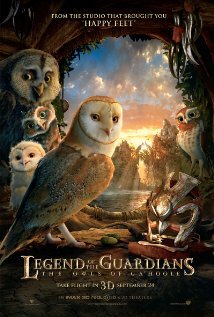 Based on the first three books in the series, a young barn owl named Soren escapes St. Aggie's orphanage to the island of Ga'Hoole to assist its noble, wise owls in fighting back. Starring Hugo Weaving, Helen Mirren and Jim Sturgess. The Owls of Ga’hoole Gift Pack !!! I love to watch action movies with DH! And super hero flicks with Keeg. And cartoon with Loch. LOL! I'll watch with anyone! I am a FB Fan - Erin T.
Movie night includes all of my kids and lots of popcorn. Maybe some wine for me. A nice bowl of buttered popcorn with my husband is the perfect way to watch a movie. My boys love this movie! And we have lots of movie nights, esp now that I'm 9m preggers. :) We enjoy the typical, cookies, candy and popcorn for treats. I love to watch movies at home with my husband and also my nephews and siblings. My sis bakes cupcakes and we make lots popcorn. Thanks! I love watching movies with my hubby and son. We usually push the couches together to make a comfy spot to lounge and make popcorn or nachos to much on. Yum! I would love to have this movie for movie night with the family. Movie night is really the only time that the entire family gets together and spends time quality time together. This would make for a great addition to our family memories. I like to watch movies with my dad and we make popcorn. i love to watch movies with my nephew. we always have popcorn with bunch a crunch mixed in! yum! We watch movies with our kids and usually have popcorn! I like to watch movies with my family, and we usually order pizza. I shared about the giveaway on facebook. Jenni Ball. I am a follower on twitter. Ladyluckjen12. jenni43435 (at) yahoo (dot) com. I love watching movies with my son, it gives me an excuse to watch all the great kid's movies that come out. We just do traditional popcorn. Hubby, daughter and I watch together. Hubby usually makes Kettle corn.